Ahh, MBL ... With analog tape! 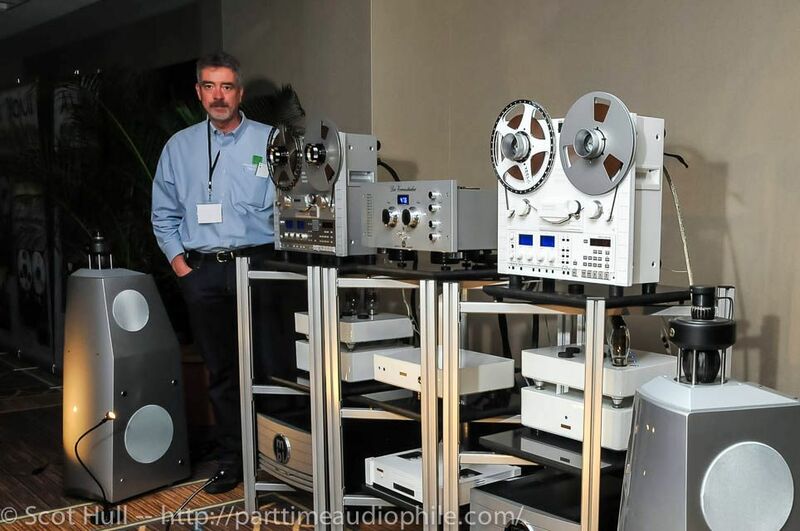 United Home Audio's Greg Beron had a pair of after-hour master-tape sessions, one each night, leading to wee-hours-of-the-morning listening to some of the most sublime recordings you can find. One off masters, anyone? Yeah. It doesn't get better than this. Candidate for Best-In-Show? You betcha. The Phase 11 tape deck, one of TAS' Top 100 Products, was shown here in lustrous white and a silver/grey. Why two? Well, two gets you seamless track-switching -- remember, this is tape! Anyway, the duo was a pretty sweet setup. Pricing for the top-of-the-line 11 starts at $22,000, but there are several models to choose from, including the entry level Phase $8,900. For more info, try here. Shown here with the MBL 116f omni-directional loudspeakers, everything was all wired up with Celtic Silver speaker cables (a UHA in house specialty) to Jolida Luxor monos (with outboard PSU) running the so-new you-that-can't-have-them KT 150 vacuum tubes from New Sensor. 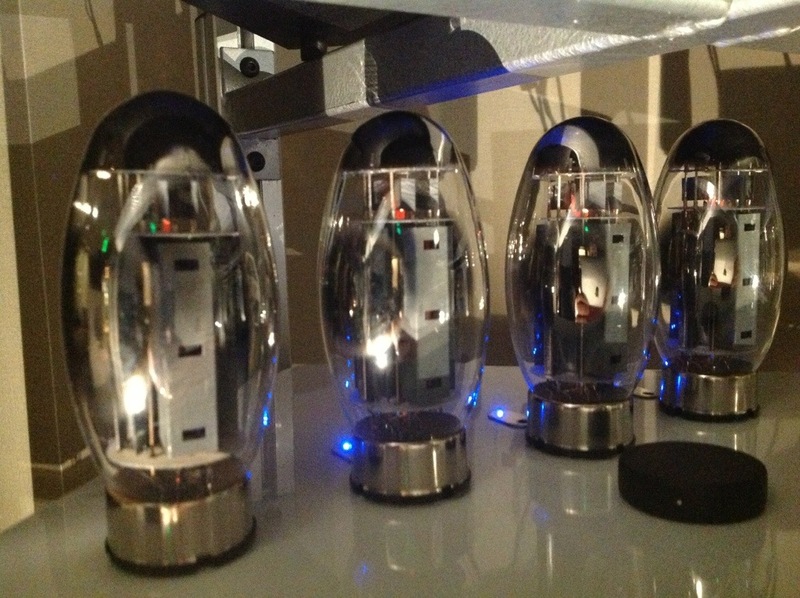 These tubes are rumored to be even more "sweet" up top than the KT120s (where "sweet" = "beautiful"), and bring significantly better bass than the KT88 and EL34 variants. Top to bottom linearity, with a rich mid-range? So say they -- I suppose this is something that will reveal itself in the fullness of time. Best sound at the show by a mile. 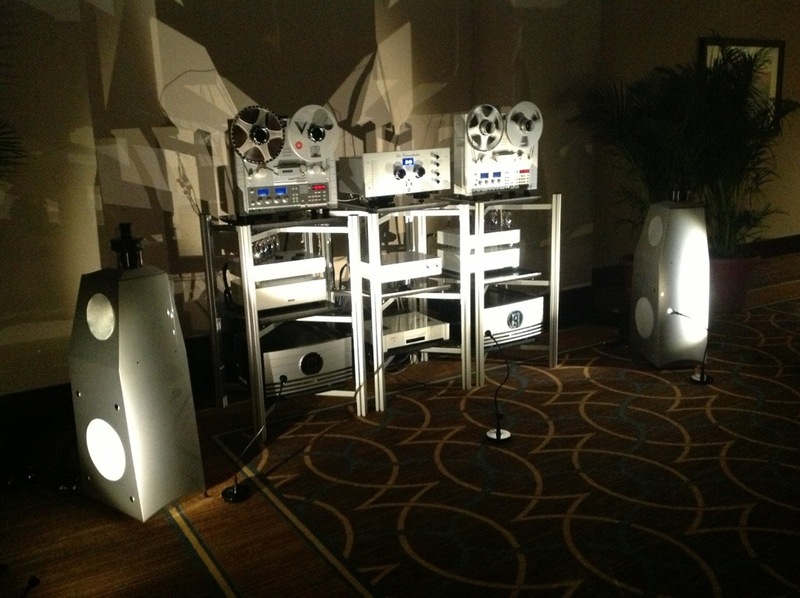 There was lots of good hifi at this show and then there was this room, it was on a different world. This wasn’t the mega buck MBL Reference gear this was the mid priced stuff for MBL but it was swinging way above it’s weight class! 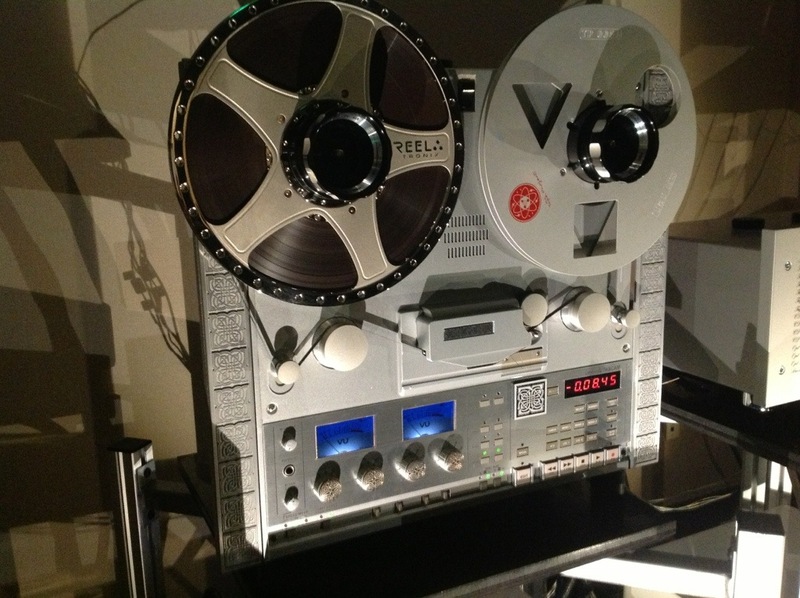 Analog tape, is it about bloody perfect or what??? I was fortunate to get the sweet spot for the after hours show and I was beaten by the dynamics, could literally see all around in the soundstage, instruments popped out of black 3D space. Tonality was perfect top to bottom. I never heard The Beatles like that, they were in the room and Paul brought his bass for this performance! Best of show honors? Loud enough! 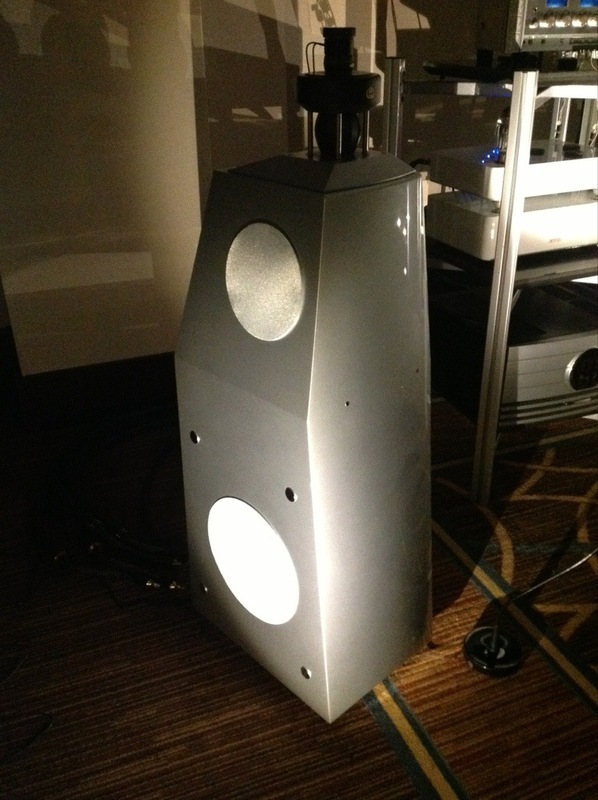 The larger speaker model ( the 116?) does the holographic tricks the best, IMHO. The smaller mbl’s sure cast a nice holographic image in the international …. (?) Room … shared w/ Mapleshade . Master tapes played. Caveat? Spkrs set too high!!! Inspite of a weird room, still good sonics! It’s worth going to shows like this just to hear the MBL rooms, they’re always a treat. This one wasn’t the most holographic, swimming in sound effect I’ve heard from them, but still almost spooky at times how the soundstage can wash over you. You almost forget about the music, and just enjoy the effect … which is equally fun. I do want to know more about those tubes!